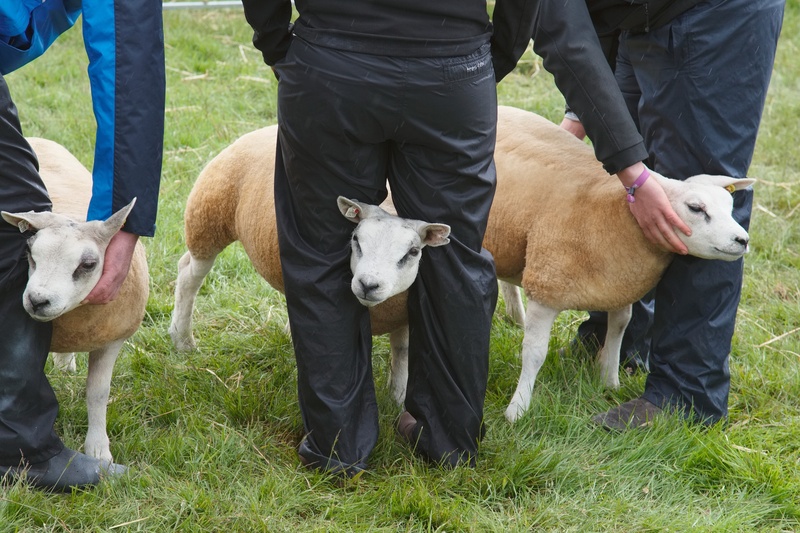 Yet they didn’t flinch as they knelt on the grass without waterproofs, holding on to their Texel, Blackface, Beltex, Cheviot, Mule, Leicester, Suffolk, Shetland and Zwartbles champions, and waiting for the judge to assess the best of all the breeds. Interbreed sheep judge Dennis Gauld from Locherbie was equally undeterred and took his time. The short bursts of rain briefly interrupted an otherwise successful event on the edge of the M9 motorway at Dunblane. The sheep classes attracted the most entries and attention, and the Scotch Mule ewe from Archie and John MacGregor, Allanfauld, Kilsyth eventually emerged as the day’s supreme champion. Mr Gauld went on to select the Blue Faced Leicester ewe from M R Thornborrow and Sons, Easter Dawyck, Biggar as his reserve champion. The Zwartbles fielded an impressive entry of 72 animals and the venue counted as the breed’s Scottish National Show. Competition was fierce for the Zwartbles championship prize, and despite the Royal Highland Show champion being in the running, she was beaten by a gimmer from Colin and Helen Duffy from Dunragit, Stranraer. The home-bred animal was born on Christmas day, and named Christmas Carol. However in the show’s first ever champion of champions competition it was the cattle interbreed champion which reigned supreme over the sheep, horse, goat, riding pony and pygmy goats winners. She was the Limousin heifer from local breeders, D and L Graham, Mains of Burnbank, Blair Drummond. In reserve place was the Charolais cow from Andrew Hornell, Fallininch Farm, Stirling. A 12-year-old riding horse from Zoe Nicoll of Cumnock, Ayrshire took the reserve champion of champions rosette. Her pony, Firefly, is no stranger to major awards having won the Horse of the Year Show at Birmingham in 2014. Dairy farmers also turned out in force to support the event, and in contrast to most shows this season, entries were up on the year. The owner of the dairy champion, Tom Gilliland from Nyadd Farm, Blair Drummond said classes had been growing steadily over the last three years, with seven entries in the heifer-in-milk class and seven in the cows-in-milk class this year. “Numbers had fallen so low that there was a move to scrap dairy classes a few years ago, but we’re seeing support growing now,” he said. Champion -T and J Gilliland, Nyadd Farm, Blair Drummond with third calver, Craigforth Design Rosette by Regencrest Design and out of Astra Starbuck Rosette. Calved in December and carrying her first calf. First show outing. Reserve – W Hamilton and Son, Meldrum, Blair Drummond with two-year-old heifer, Hawkland Dorcy Lisa by Dorcy and out of a Jeeves cow. Champion – Cardona Farm, Doune with yearling heifer, Cardona Jewel Erica by Nightingale Dunbar and out of Cardona Jewelst Erica. Champion at Angus, second in class at Highland Show. Reserve – Cardona Farm with yearling bull, Cardona Edwin by Cardona Edwin and out of Cardona Edwina. First at Stirling, male champion at Gargunnock. Chamoion – Andrew Hornell, Fallininch Farm, Stirling with rising seven-year-old cow, Fallininch Empress by Fallininch Bigboy and out of Gower Amour. Champion as hefier at Drimmin Show. Reserve – Andrew Hornell with 18-month-old heifer, Fallininch Libby by Dereskit Fernando and out of Fallininch Fenetia. Third in class at Highland Show. Champion – George Harvey, 100 Buchanan Street, Balfron with five-year-old cow, Harveybros 1 Crocus H3 by Parkhill Pompeii and out of Harveybros 1 Crocus C4. A prolific winner as a heifer. Reserve – George Harvey with five-month-old heifer calf, Harveybros 1 Crocus N5 by Venture Nighttime and out of the champion. First in class at Stirling. Champion – Donald and Bryon MacNaughton, Centre Street, Kelty with two-year-old heifer, Hayley of Rannoch by Conor 2nd of Lagg and out of Hayley 5th of Earn. Champion at West Fife and reserve champion at Fife show. Reserve – Blairlogan Highlanders, Greenhead Farm, Alva with six-year-old cow with calf at foot, Solas Emma 4th of Benmore by Angus of Auchnacloich and out of Solas Emma of Benmore. Champion at Drimmin, champion at Campsie, second in class at Highland Show. Champion – D and L Graham, Mains of Burnbank Farm, Blair Drummond with yearling heifer, Burnbank JLO by Loosebeare Fantastic and out of Burnbank Geri. First in class at Gargunnock, second at Highland Show. Reserve – D and L Graham with two-year-old heifer, Burnbank Jojo by Wilodge Fastrac and out of Burnbank Bindy. First at Gargunnock and first at Stirling. Champion – James Wightman, Coxhill Farm, Maddison, Falkirk with yearling heifer, Team Casy by Auchoracham Winger. Champion at Drimmin, champion West Fife, reserve champion Stirling, first in class at Highland Show. Reserve – T A and E Henderson, Dargill Farm, Crieff with two-year-old heifer Annick Trixibelle 15th by Anick Claymore and out of Anick Trixibelle 8th. Champion at Stirling. Champion – Hugh Dunlop, Holehouse Farm, Cumnock with 14-month-old Limousin heifer, Haud Yer Wheest by Lodge Hamlet. Winner of carcase competition at Ayr Young Farmers Rally in May. Shown by Sean Kennedy. Reserve – Stewart and Lynsey Bett, Castleton Farm, Airth with 20-month-old Limousin heifer, Randerson Jasmine. Champion at Drimmin, Gargunnock, Stirling and second at Highland Show. Champion – Fiona Fairley, Avondale Cottage, Avonbridge, Falmirk with three-year-old British milker, Ladeside Lady Ria. Reserve – Fiona Fairley with yearling goatling, Kadyside Lady Rosemary. Pygmy – Kim Falconer, Duntrune, Dundee with milker, Moorview Lily II. Clydesdale – Charlotte Young, Hall Farm, Ayr with three-year-old mare, Lily, bought in Ireland. Champion at Ayr and Dundonnald. Reserve at Drimmin and Fife. Reserve – John Adamson, Easter Glentore Farm, Longrigend, Airdrie with two-year-old filly, Barlauchlan Linda by Arradoul Balvenie and out of Barlauchlan Sweet Charm. Second at Highland Show and first at Ayr. Champion – Donald MacGregor, Dkye, Milton of Campsie with a rough ewe. Reserve – North Amulree, Dunkeld. Champion – M R Thornborrow and Sons, Easter Dawyck, Biggar with a ewe by a Midlock sire and out of a ewe by an Old Hemley sire. Champion at Dunblane as a ewe lamb. Reserve – Jamie Pirie with a tup lamb by Highberries Hotshot and out of a Firth-sired dam. On his first outing. Champion – M Burks and J Pettigrew, Eastbank Farm, Lenzie with a one crop ewe by Didcot Drambuie and out of a ewe by Eildon Eiger. Champion at Beith and Stewarton. Reserve – G Whyte, Pett Farm, Muthill with a home bred Charollais cross Beltex ewe with Beltex sired lambs at foot. Champion – H Shepherd, Mains of Callander Farm, Callander with a Hampshire Down tup lamb by Callander Bomber ad out of an East Fortune-bred ewe. Champion – A McGregor, Allanfauld Farm, Kilsyth with a ewe by a Firth sire and out of a home-bred Blackface ewe. Champion at Stirling. Champion – Rena Douglas, Cedar Cottage, Old Mill Road, Craigrothie with a white shearling tup, Drum Cruachan by Drum Balblair and out of a Drum ewe. A first prize winner at the Highland Show in 2015. Reserve – Suzanne Meikle, Winchburgh, West Lothian with a black one-crop ewe Brae Alice by Brae Faroe and out of Cluelow Agnes. On her first show outing. Suffolk – R Bryce, Chalmerston Farm, Stirling with three-crop ewe by Cairnorrie Olympic Bolt and out of a home-bred ewe. CHampion at Stirling and Gargunnock. Reserve- R Hiddleston, Rigghead Farm, Dumfries with a ewe lamb by Black Magic and out of a Strathisla-bred ewe. Champion – Robert Cockburn, Hill of Errol, Perth with a two-shear tup, Ettrick Van Gogh by Sportsman’s Unimog and out of a dam by Ettrick Rainbow Warrior. First at Perth in 2015. Reserve – Robert Cockburn with a ewe lamb by Tullagh Whisky and out of a dam by Clynog Joetex. On her first show outing. Colin and Helen Duffy, The Smiddy, Dunragit, Stranraer with a home-bred gimmer, Christmas Carol by Aquila Aftershock and otu of Blacklee. Won Highland Show as a lamb last year. Reserve – McLaren and Baird, Greystone Cottage, Dunblane with a gimmer by Greystone Alan and out of a Tardoes ewe. Champion at the Highland Show, champion at Drimmin and reserve champion at Ayr.